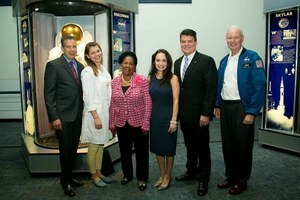 International science education initiative touches down at Space Center Houston. Houston is the first city in Texas to host g4g. BAYTOWN, Texas, May 15 /CSRwire/ - International science education expert and engineer Melissa Rancourt brought her global greenlight for girls (g4g) initiative to Space Center Houston today. Hundreds of local girls, ages 11-15, participated in the day-long interactive, hands-on science event with retired NASA astronaut Brian Duffy and nearly 100 Covestro LLC scientists,engineers and other employee volunteers. Click to tweet: . @CovestroGroup and @greenforgirls inspire 100s of girls to pursue #STEM at first-ever #g4gDayHouston at @SpaceCenterHou: http://bit.ly/2qB4Ucp. g4g Day Houston, sponsored by Covestro as part of its i3 STEM initiative, marked the first-ever g4g event in Texas. g4g is an international organization that introduces girls of all ages and backgrounds to science, technology, engineering and math (STEM) studies and careers through fun, interactive, hands-on workshops delivered by STEM mentors. Covestro is one of the world’s leading suppliers of polymers, and its largest manufacturing facility in North America is based in Houston, Texas. Girls from underserved school districts around Houston, including Southwest Schools, KIPP Liberation College Preparatory, Odyssey Academy, and the five Goose Creek Independent School District junior high schools (Baytown, Cedar Bayou, Gentry, Highland and Horace Mann) spent the day codebreaking with the help of code.org; making batteries from fruit; building their own MARS Rover and creating their own polymers. Since 2010, more than 150 g4g Days have been held in 45 cities across six of the world’s seven continents. Most recently, Covestro and g4g launched in New Delhi, India, where 200 girls were welcomed in person by Covestro CEO Patrick Thomas. There are already plans in motion to bring the g4g Day events to Moscow and Banghkok. “Around the world and across the United States, wherever g4g goes, we see how profoundly interested girls are in science. Our goal is to capture that interest and get girls thinking about the possibilities of careers in science, technology, engineering and mathematics in order to build a future talent pipeline of female STEM leaders worldwide,” said g4g founder Rancourt. With i3 STEM, Covestro has its own rich history of supporting and strengthening STEM education. A cradle-to-career initiative, i3 STEM in Baytown provides innovative, experiential education experiences beginning in elementary school with employee-volunteers and at the i3 STEM Center at Eddie V. Gray Wetlands Center; progressing on through junior and high school with Robotics Clubs, mentoring, career counseling and science fair judging; and, working at the higher education level with scholarships and internships and through the STEP Ahead initiative. Launched in 2012 by the National Association of Manufacturers, the initiative examines and promotes the role of women in the manufacturing industry through recognition, research and leadership for attracting, advancing and retaining strong female talent. Together, Covestro and g4g share a common mission to expose more girls to STEM subjects and role models and increase their participation in STEM careers. According to the National Science Foundation, while women have made gains in U.S. STEM fields, they remain sorely underrepresented in engineering (15%), the physical sciences (31%) and computer and mathematical sciences (25%). i3 (ignite, imagine, innovate) is Covestro LLC’s companywide corporate social responsibility (CSR) initiative that aims to spark curiosity, to envision what could be and to help create it. Built on the three pillars of philanthropy (i3 Give), employee volunteerism (i3 Engage) and STEM education (i3 STEM), i3 seeks to create sustainable and lasting impacts. i3 Give is designed to innovate corporate philanthropy strategies that combine both human and financial resources to build stronger communities. i3 Engage re-imagines the way employees from for-profits and nonprofits engage with one another for more effective outcomes. And, i3 STEM ignites young minds to become the innovators of tomorrow through support of hands-on, inquiry-based STEM education, workforce experience and employee volunteerism. Greenlight for girls is an international organization dedicated to encouraging girls of all ages and backgrounds to pursue STEM careers by introducing them to the world of science in fun and exciting ways. Founded five years ago by engineer, Melissa Rancourt, greenlight for girls has volunteers operating in every continent of the world, encouraging girls of all ages and backgrounds to get involved in science-related careers, through a variety of activities. Find more information at www.greenlightforgirls.org.